Guided meditation with healing and balancing suggestions for each chakra. Essential Oils balancing for each chakra. Tips for yoga poses for each chakra. 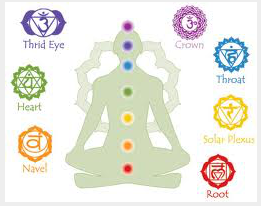 The word chakra is derived from Sanskrit, meaning “wheel”, or “circle of life”. There are seven main energy centers found in the body and they are associated with a variety of colors, symbols and Gods. In Hinduism, the continuous flow of energy throughout the chakras is referred to as “Shakti”. The concept of chakra was first mentioned in the ancient sacred Hindu text, The Vedas, but also plays an important role in Tibetan Buddhism. 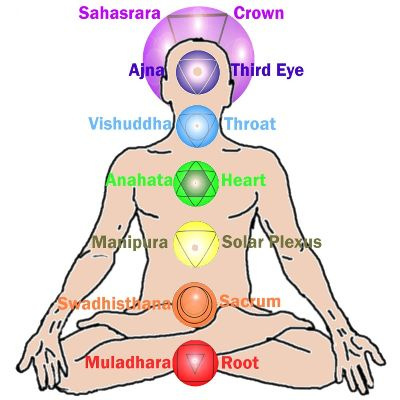 Chakras are located along the spine and influence different nerve systems, organs and glands with their energy. These vortexes of energy are originated from Brahman, according to Hindu beliefs. It is presumed that as Shakti flows from one chakra point to another it exhausts the body and soul. The energy that becomes coiled in the base of the spine (root chakra) is called Kundalini. The spiritual goal is to awaken and release the Kundalini in order to attain a greater consciousness and merge it with the Infinite consciousness. Through meditation and Kundalini yoga, the energy can pass back up the spine until it reaches the top of the head (crown chakra), producing a mystical experience. 1. Muladhara: The Root Chakra – located at base of the spine. Associated with red. It affects your confidence, trust in life and self-esteem. It is from here that our base instincts arise; the need to survive or the fight or flight reflex. Hindu God - Ganesh and Brahman.